Strength performance. Increase blood circulation, growth hormone production, muscle hardness. Pharmaceutical Grade. Benefits of Arginine AKG: promotes protein synthesis, increase nitric oxide levels to extend muscular pumps & hardness, increase blood flow & nutrient delivery to muscle, and improves circulatory health & sexual function, increase growth hormone levels. 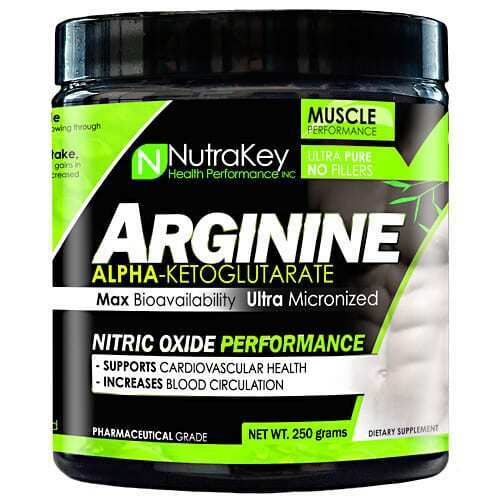 Arginine AKG lean muscle growth & rock hard muscle: arginine alpha-ketoglutarate (AAKG) boosts nitric oxide (NO) levels which increase blood volume flowing through muscle tissue resulting in extended muscle pumps and delayed fatigue. Arginine AKG increases oxygen & nutrient delivery, glucose uptake: Muscle velocity, blood flow, & power output. AAKG helps amplify muscle-growth signals giving faster gains in lean mass & accelerates fast & slow twitch muscle fiber for greater strength, improved recovery, & increased endurance. Increased blood flow also contributes to enhanced sexual performance. Arginine AKG is a more bio-available from of L-Arginine: utilized in muscle metabolism, ammonia detoxification, hormone secretion, & immune system. L-Arginine is considered semi-essential amino acid because, although it is normally synthesized in sufficient amounts, supplementation is sometimes required. Stimulates natural growth hormone (GH): GH is important for muscle growth & fat loss. Medical studies show arginine AKG has powerful GH stimulating effects. Arginine AKG is far safer & more cost effective: than growth hormone treatments such as HGH injections. GH is one the most powerful hormones: in the human body which promotes the growth of lean muscle tissue & the loss of fat. As you age, growth hormone levels drop which is one reason you lose muscle & gain fat as you age. In a controlled trail, arginine & other amino acids were combined with weight training to effectively enhance growth hormone levels.